This is by far one of the best books to start the summer off with, as it’s packed with summer-friendly recipes that are delicious and easy to make. 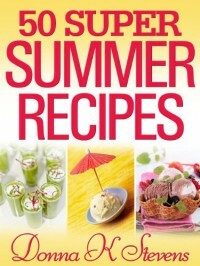 “50 Super Summer Recipes” has everything from salads to recipes for the grill, and all are sure to impress your guests. Some of my favourite recipes were the Garden Fresh Tomato Soup and the Ginger Lemonade just to name a couple. The Apple Pizza was an instant hit with my kids and easy to make. This a wonderful book to inspire and get you hungry and cooking real fast. Pick this book up for the cook in your life.